The disconnect between Ohio Gov. John Kasich’s call for bipartisanship at the national level, on healthcare, compared to his almost non-existent record of partnering with Democrats in Ohio on virtually any issue is a total embarrassment. “Americans will be served best when we work together to create lasting reforms. 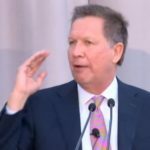 It’s been done before and it can happen again,” Kasich, the Buckeye State’s term-limited, lame-duck leader said in an email to his fan base recently. John Kasich showed how much he wasn’t for bipartisanship when he voted no with every other Republican on President Bill Clinton’s first budget in 1993, the one that raised tax rates on the rich that generated the revenue Kasich later boasted he used as chairman of the House Budget Committee to balance the federal budget. A balanced federal budget has been one of Kasich’s long-standing but misguided Quixotic quests, one he pushed as a state senator in Ohio and continues to push today, even though economists of note, like Nobel Prize-winning economist Paul Krugman, say it would be bad if not disastrous should enough states petition to convene a constitutional convention. Meanwhile, the simplest bipartisan solution is to raise the income tax cap that would guarantee Social Security’s longevity through this century by taxing America’s wealthiest, who don’t pay into the system on income over the current limit capped at $$118,500. National media types like Anderson Cooper at CNN or TV media buddy Chris Mathews at MSNBC give him air time and leeway to air his carefully crafted but phony message calling for both sides to come together. When back home in his adopted state of Ohio, his record of acting in concert with Democrats on any issue of importance is next to nil. Shame on Cooper and Mathews for not doing their homework on his record of poor performance. In between appearances to push more sales of his latest book, “Two Paths: American Divided or United,” – that again retells his life story, updated this time with references related to his second losing campaign for president last year, and his numerous out-of-state travels now that any worry about what Buckeye voters think of him is irrelevant since he won’t be running for any Ohio office – Kasich should put some action where his mouth is on bipartisanship. A list of issues as long as his arm is available to show he can work with Democrats in a bipartisan way. But don’t expect him to actually broker any deals with Ohio Democrats, who he’s left in the lurch since he assumed office in 2011, when his first partisan act was to back a provision to gut collective bargaining for public union workers. Senate Bill 5 was passed by a Republican-controlled legislature and signed by Kasich, but rejected 2-1 by voters. It takes persistence, a super ego, and a lot of brass to not do in Ohio what he’s calling on others to do in Washington. Kasich should start in Columbus to show he’s more than a flim flam governor who has used Ohio taxpayers to cover his travel and security costs on his personal quest for higher office. When voters elected him to be governor for the first time in 2010, he set his compass for the White House. When he ran for reelection in 2014, he spread a thick layer of fog about his real intentions to run for president. When voters elected him second time, they didn’t do so knowing he would orchestrate, at their expense, a second quest for president.